Fund raiser at Villa Bardini organized by our students from the Event Planning course. 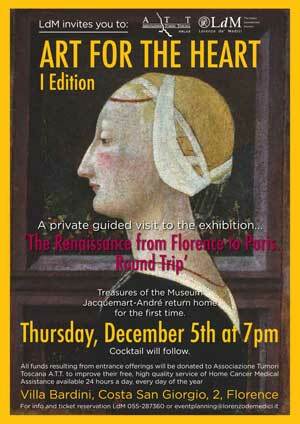 The delights of the evening include a guided tour of the internationally-acclaimed art exhibition: “The Renaissance from Florence to Paris. Round Trip,” as well as a Renaissance cocktail, portrait and photo corners with Renaissance costumes, Renaissance dancing and music, an olive oil tasting (and an explanation of how it was used in Renaissance times) by Torre Rossa, and a scent and perfume exhibition by Dr. Vranjes. All funds resulting from entrance offerings will be donated to Associazione Tumori Toscana A.T.T. to improve their free, high quality service of Home Cancer Medical Assistance available 24 hours a day, every day of the year. When: December 5, 2013 at 7 p.m.